Shining the spotlight on high visibility and fluorescent textiles, Dave Matthews considers the present market and future possibilities for protective technical textiles. Safety and protective textiles refer to a garment’s target and other fabric related items designed to protect the wearer from harsh environmental effects that may result in injury or death. It may be also be necessary to protect the environment from the people, as in the case of cleanrooms. Safety and protective materials must often withstand the effect of multiple harsh environments. There have been considerations and discussions as to how we in the EU/ISO Standardisation field can introduce innovative textiles, such as those incorporating high visibility and fluorescent capabilities into fibres. The large fibre and fabric manufacturers are occasionally intertwined, with some of the largest companies working with their competitors in the manufacture of fibre and/or fabric. The largest manufacturers will work with others where there is benefit and obviously for business advantage. Some of the specialist manufacturers of fibres and fabrics are also beginning to share ideas and produce, with their competitors, really interesting and quality products. I am aware that there are a number of companies who have introduced high visibility style fabrics into their garments and this is obviously a step towards where the user in particular would wish to be. It is now imperative that the market considers and develops fabrics with in built high visibility qualities as the costs associated with cleaning and maintenance of trim are excessively high, as well as difficult to maintain to the appropriate standard. The area that will need to be addressed and the market assured of relates to the cleaning, maintenance and repair of such PPE garments. This is due to the EU PPE Directive, Annex II, Basic Health and Safety Requirements (BHSR), which stipulates that we, as being responsible for preparing standards and manufacturers placing PPE on the EU market, address all of the applicable BHSR. High visibility requirements are presently stipulated in EN ISO 20471. It would greatly assist those involved in the manufacture, procurement or use of PPE with an element of high visibility to secure funding from the EU Commission to address where we take this matter to give security to all involved. Great changes have occurred in the fabrics used for clothing, with heavy woollen and worsted suits being replaced by lighter materials. These are often made from blends of natural and manmade fibres, possibly owing to improved indoor heating. Warp-knitted fabrics made from bulked yarns are replacing woven fabrics, and there is a trend away from formality in both day and evening dress to more casual wear, for which knitted garments are especially appropriate. The use of synthetic fibre fabrics has established the easy-care concept and made formerly fragile light and diaphanous fabrics more durable. The introduction of elastomeric fibres has revolutionised the foundation-garment trade, and the use of stretch yarns of all types has produced outerwear that is close fitting but comfortable. Recent innovation has seen Greater Manchester Fire and Rescue Service (FRS) introduce a layered approach to its PPE for fire fighters. This followed a programme of consultation, research and development and assessment, prior to the roll out to personnel. The base layer comprises lightweight garments for the upper torso and legs, with the upper garment (jacket) comprising high visibility qualities, which allow fire fighters to meet the requirements of EN ISO 20471. In a move away from the traditional approach to PPE design, fire fighters are issued with fire coats and trousers designed for structural fire fighting to be used for all operational activities. Greater Manchester FRS has designed and introduced a new layered approach using three garments, which when used in different combinations provide the required levels of protection for structural and wildland fire fighting, as well as technical rescue operations. These garments have been designed to ensure that a fire fighter is wearing garments that are suitable for the role being undertaken, rather than wearing structural fire clothing for all roles including technical rescue and wildland fire fighting. Protection from heat, flame, molten-metal splashes and radiation sources are a prime requirement for both civil and defence applications. The condition influencing demand depends upon specific environmental hazards: the degree of protection, the level of comfort, durability of the garments and the aesthetic as well as sociological factors, such as legislation and consumer awareness of possible hazards. Flame resistant fabrics are designed to resist ignition and to self extinguish when the ignited source is removed. In general a properly designed flame resistant fabric will prevent the spread of flame when subjected to intense heat or flame. Resistance to both flame and associated heat transfer through the garments is defined as thermal protection. 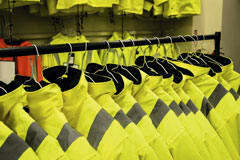 We in the UK have addition Legislation in the form of The Roads and Streets Act, that require those4 working on Major A and B roads to also wear a high visibility surcoat. This totally defeats most, if not all of the work we have done on comfort of the user, as for example, fire fighters’ structural fire fighting garments (EN 469:2005) already have fitted 1/3 metre of high visibility/ fluorescent trim. One of the most important aspects of protective clothing must be its comfort, which as we know needs to be balanced against the level of protection afforded. It is commonly understood that the user will not be able to function, either proportionately or even completely if the garment worn creates greater hazards to the wearer, as opposed to the protection afforded. This can be due to the body’s core temperature being affected, or that the PPE is simply uncomfortable to wear. Breathability in a laboratory at temperatures of 25ºC ±2 surely cannot be replicated in real life working conditions, which in the case of fire fighters can be 250ºC, or in extreme flashover scenarios 800-1,000ºC for 8-10 seconds. I challenge any manufacturer to provide the evidence that those of working environments can match test laboratory results. With the development of a new and innovative ‘Sweating Torso’ test method, we are reliably informed by almost all the scientist involved that this test method will not only indicate the performance of any protective clothing or ensemble, but that it will be able to rank its performance. This will surely be gold dust to those wanting to procure PPE and also to the end users, who at long last might be able to better understand the performances of one PPE compared with another. At the recent meeting of CEN TC162 Protective Clothing including Hand Protection and Lifejackets, I raised with the Convener of TC 162 WG7 high visibility, the desire to meet EN ISO 20471 by the trim fitted to the fire fighters garments. This has recently been achieved in Australia and New Zealand by a new standard. The Convener assured me that they were working on two existing standards and the outcome should be a standard allowing garments to be certified to Type 2, along the lines I had requested. There are obviously a number of manufacturers and companies working to develop and bring to the market products whereby the high visibility and fluorescent requirements of standards (CEN and/or ISO) are built in at the weaving stage. In addition a number of EU Commission funded projects are also reviewing and attempting to introduce innovative products to the marketplace. I am a Board Member of a number of EU Commission funded projects. The recently completed IFREACT project developed three new chemical, biological, radiological and nuclear (CBRN) suits, which give a real improvement in the comfort (less heat stress) to the wearer. With final trials held at a French Military Base at Cazau near Bordeaux, these trials also incorporated an Ebola exercise to test the garments for possible use in this area. The second EU Commission funded project is Smart@Fire. This project started from a concrete need for which the market cannot currently offer a suitable solution, and research and development efforts still remain to be performed by suppliers. In this scenario, the procurers cannot carry out a regular procurement procedure to purchase a Personal Protective System (PPS). By launching a pre-commercial procurement (PCP) tender, they incentivise the suppliers to enter into research and development, as in each phase (solution design, prototyping and batch production) participating suppliers are awarded with extra budget for development. Smart@Fire is getting closer and closer to its final goal: The purchase of a smart PSS for individual fire fighters comprised of a PPE turnout gear and loosely coupled ICT system. The ICT system integrates safety critical functions of a PPS of individual fire fighters, and acts as a communication node for additional personal protection equipment as well as interface to the local centre of command. The system must be compliant with, and needs to be fitted into the fire fighter turnout gear.